WASHINGTON, DC — Legendary journalist Simeon Booker, who became known world-wide during his lifetime as a key messenger of news that helped America focus on civil rights injustices in the last half of the last century, was honored here this week with a first class farewell at the historic Washington National Cathedral. Well-established figures in the news media and politics gathered for the low-key tribute to Booker who died at in December at age 99. The Washington Bureau Chief for Johnson Publishing Company’s Jet and Ebony Magazines for nearly half a century. His reporting for the publications earned them and him national recognition, despite risking his life numerous times to report the news. Booker retired in 1997 at age 88. “We area better people because of the struggle of one man,” U.S. Representative John Lewis, told the gathering, referring to Booker. “Simeon was there (reporting across the South during the 1950s and 1960s) reporting truth to the world,” said Lewis, asserting the Civil Rights era and movement would have been “like a bird with no wings” had Booker not done the kind of reporting he did. Lewis, a native of rural Alabama, grew up on his sharecropper family’s farm in Pike County. He rose to national attention as student civil rights activists while attending Nashville’s Fisk University in the early 1960s. He came to know Booker while attending the racially segregated schools of Pike County, he said. He read Jet Magazine. Reading Booker’s dispatches in Jet every week made him (Lewis) feel “free, liberated, like a whole new world was opening up to me,” Lewis told the audience, explaining reading the magazine gave him an eye-opening window on the world beyond rural Alabama. 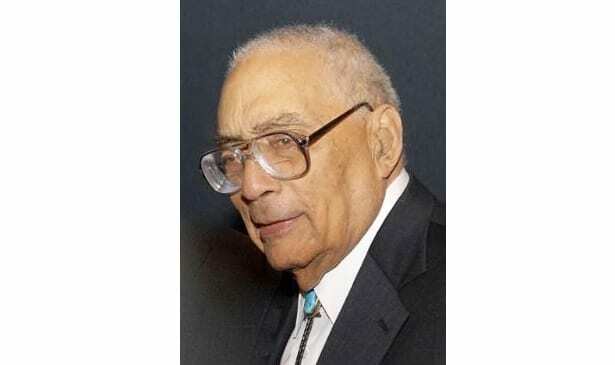 As Lewis expanded his civil rights work and involvement in politics as a vehicle for advancing human and civil rights, he and Booker crossed paths frequently, Lewis noted, on the civil rights trail and in Washington on the National Mall with the Rev. Dr. Martin Luther King Jr. and later in the halls of Congress. ‘He (Booker) laid claim to the struggle of Black masses,” Lewis told the audience. As U.S. Congresswoman Eleanor Holmes Norton and others among the audience nodded in agreement with Lewis’s comments, another tribute speaker echoed the sentiments. Graham told the audience that Phillip Graham, his late father, hired Booker in the early 1950s as the first Black news reporter for the Post. “Both he (Phillip Graham) and Mr. Booker took a chance,” Graham said candidly and proudly, noting being the first Black reporter for the lily white moderate newspaper was quite a gamble for Booker. “It turns out it (the risk) was good for both,” Graham said. “We should all praise Simeon Booker and thank the Lord,” Graham told the audience. In offering the pastoral homily celebrating Booker, the Rev. Monsignor Raymond East from the Saint Teresa of Avila Roman Catholic Church told the audience Booker was work done with the blessings of God. “ God is not finished speaking or working miracles,” East said, echoing the sentiments of many in the audience who recalled how much Booker risked his life. Booker was among those journalists who, in the 1950s, were considered pioneers in boosting the significance of civil rights coverage by main stream media in America. At Jet and Ebony magazines, his writings, highlighted by his weekly Ticker Tape columns in Jet, helped make the publications main ingredients on the current events reading menus of millions of people across America and around the globe, regardless of their backgrounds or literacy level. Booker was noted most for his historic reporting on the 1955 lynching murder in Mississippi of 14-year-old Emmett Till, an Illinois teenager visiting relatives in Mississippi. Till had been beaten to a pulp then hanged by a group of white men set on punishing Till for reportedly whistling at a White woman at a small town neighborhood grocery. Booker’s reporting with vivid, shocking pictures taken by Jet Photographer David Jackson, shocked the nation and is cited for helping spur new attention to civil rights abuses and demands in the late 1950s. Booker’s coverage for Jet pushed other mainstream media outlets to improve their coverage of racial issues across the nation, with a focus on the South. His reporting earned him a seat at the table of influential journalists in Washington. John H. Johnson, the publisher of the monthly Ebony Magazine and Jet, the magazine’s small sister weekly publication, moved Booker to Washington as Jet Bureau Chief. Booker kept that position until he retired in 2007. “Mr. Booker was relentless, focused and had a sharp sense of humor,” said Bryan Monroe, VP and Editorial Director of Ebony & Jet magazines from 2006-2009. Monroe, nearly half Booker’s age, grew up reading Jet. “Even in his later years, he would show up to support young journalists trying to follow in his footsteps” said Monroe, Booker’s last editor and today a journalism professor at Philadelphia’s Temple University. While he was highly noted for his Emmett Till reporting and writings, Booker was widely regarded among journalists as a pioneer on race reporting. In addition to his reporting on Till’s lynching, he was believed to be the first journalist to ride in 1961 with the Freedom Riders, non-violent citizens seeking to end racial segregation in interstate bus transportation. In 1965, Booker walked with non-violent civil rights workers in Alabama’s Selma To Montgomery March, the peaceful march that turned into a bloody confrontation with Alabama State Troopers on the Edmund Pettus Bridge near downtown Selma.